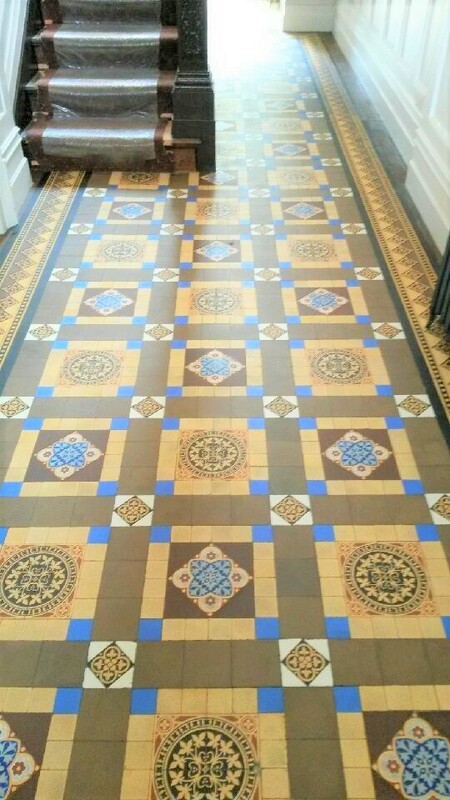 The photographs below are of a lovely Victorian tiled hallway that had been repaired and cleaned by another tradesman a his a few months earlier. The workman had left the customer to seal the floor himself, which he had done but the floor ended up looking patchy and dull and he wasn’t happy with the results which didn’t highlight the beautiful colours in the tile. Realising he needed help to achieve the correct finish I was given a call and asked to finish the floor. The property was in Hebden Bridge a market town situated between Halifax and Rochdale. After carrying out a survey, I advised that the floor would need re-cleaning to strip off the sealant he had applied and to remove the marks from the floor. We would then be able to re-seal the floor correctly for him. We agreed a price for the job and set a date to carry out the work. On the first day we started preparing the hallway to be cleaned by covering the stair carpet and new and expensive wood panelling and skirting boards to protect them from any possible marking during the cleaning process. I then used a 200-grit Diamond burnishing pad attached to a rotary buffing machine to remove the sealant and dirt from the floor. In this instance the pad was applied just with water which is used to lubricate the pad, the resultant slurry is then removed with a wet vacuum. The advantage of using this process as opposed to a chemical clean is that moisture is kept to a minimum which is important on old floors like this where no damp proof membrane exists. After making sure that the floor was to a standard that I was happy with, I then repeated the process along the edges with a set of hand-held diamond blocks which makes it easier to get into the corners and edges where the machine struggles to reach effectively. Still concerned about the moisture levels in the floor I decided to give the floor an acid wash using Tile Doctor Acid Gel which will neutralise any alkaline salts in the floor. As I mentioned earlier this is a common problem on floors of this age, they do not usually have a Damp Proof Membrane fitted so moisture is able to rise through the tiles bringing with it salt which gets left on the surface of the tile, this process is more commonly known as Efflorescence. The floor was then rinsed with water and the floor dried as much as possible using the wet vacuum. Finally, I tidied up before leaving for the day and allowing the floor to fully dry out overnight. Returning the next day, I first took moisture readings to ensure that the floor was dry enough to seal. If a floor is too damp the seal won’t cure properly and therefore won’t be effective. Fortunately, on this occasion the floor was within limits and I could proceed to apply four coats of Tile Doctor Colour Grow sealer allowing around thirty minutes between coats for drying. Colour Grow is a breathable impregnating sealer that allow moisture to evaporate from the floor whilst also protecting it from dirt and stains. This sealer leaves a matt finish which is what the owner wanted but it also enhances the colours in the tile which really being the floor alive. The customer was very pleased with the results, the floor looked much cleaner and will be easy for them to maintain. I hope that you can see the difference from the before and after pictures. 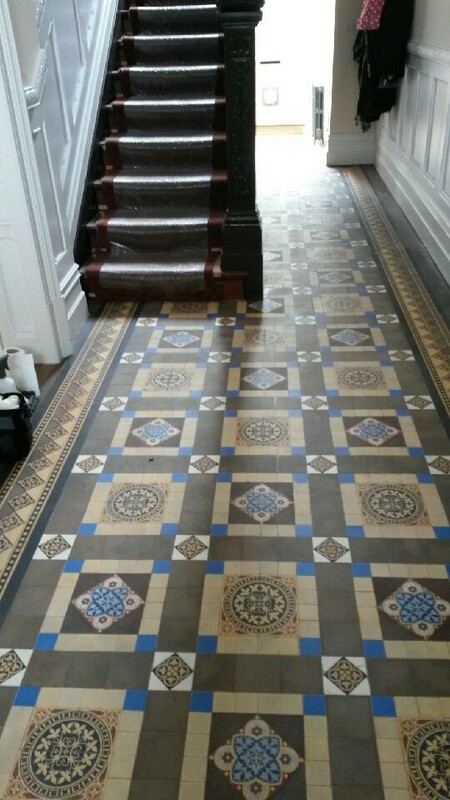 This entry was posted in Acid Wash, Clean, efflorescence, floor cleaning, Hebden Bridge, Repair, Tile Cleaning Activities, Victorian Tiled Hallway, West Yorkshire, Work History by TileProf. Bookmark the permalink.